Football Sportsman of the Week continue, but we check down to the college ranks. This blog likes big wins. How about two big wins in a row! 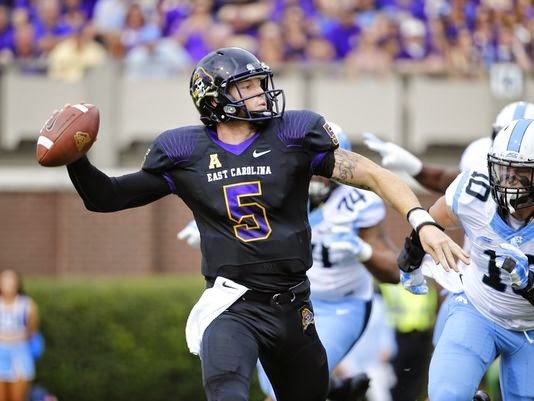 Let's look at East Carolina QB Shane Carden. The senior quarterback has led the upstart Pirates to two straight wins, both against ACC ranked teams. On Saturday, Carden picked apart the North Carolina defense for 438 yards and 4 TDs in a 70-41 route of the Heels. He was also over 400 last week at Virginia Tech and rushed for the winning TD. Mr. Carden has the Pirates in good shape for a solid bowl, and is our Sportsman of the Week!